Two students at Williams College have claimed responsibility for a cryptic message that was painted on a wall in one of the school’s buildings, officials said. On Saturday, a visitor to the college discovered “AMKKK KILL” written on a wall in Griffin Hall in a material that resembled blood, Williams spokeswoman Mary Dettloff said. The students who stepped forward told officials they were going to write “AMERIKKKA” but “for whatever reason” didn’t, Dettloff said. The students said they didn’t do it with racist intent; instead, “they said they wanted to draw attention to what they felt was racism in the election of Donald Trump,” Dettloff said. The students were not identified because it would violate federal law, Dettloff said. 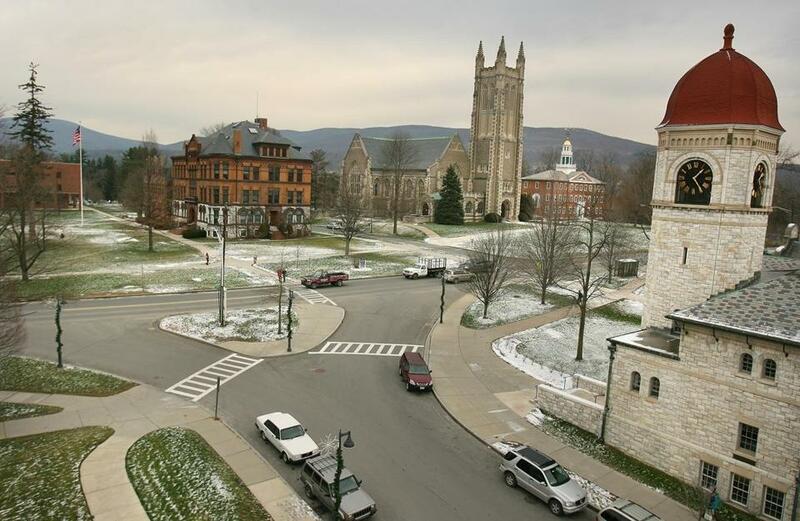 The Williams College president wrote a letter to the community to notify them of the incident and another to update them on the two people found responsible. The students used a wood-stain material that “was splattered down the stairs inside Griffin [Hall] from the top to the first floor,” Falk wrote. Griffin Hall is one of the college’s older buildings that is used as class space, Dettloff said. The students will be processed through the college’s disciplinary system. Dettloff said she couldn’t comment on what action would be taken. In the letter, Falk said their actions are being taken seriously. “Their actions did much more than damage property; they harmed our entire community and caused considerable fear, among students in particular,” Falk wrote.